Since my apartment hunting was over more quickly than I expected, and I’ve been enjoying the San Francisco food far too much, so I decided to go for a bike ride this morning. With the Golden Gate bridge looming, how could I resist? The guys at Blazing Saddles gave me some general directions when I rented my bike, but there were a few sections that were tricky to follow, so I’ve mapped the route I ended up taking from downtown San Francisco, and give my own directions below. I rode from the city to Sausalito and back again, with a nice lunch spot at the turn-around point, and it was about 22 miles total with some non-trivial hills. For convenience I’ve started the map at Powell Street BART station, but I actually did a more complex route through downtown, since I had errands to run. There’s a great bike lane down Market Street though, so I recommend taking that south until you get to Page Street. This is then a straight shot to Golden Gate park, and it’s mostly quiet, residential and bike friendly, though you will need to navigate frequent stop signs. In the park itself you take bike paths through the north-east corner to Aguello Boulevard. That heads north towards the massive Presidio park, and it can be a little tough dealing with the traffic despite the bike lane. Once in the park, continue along Aguello until Washington splits off to the left. Washington will take you up and over the ridge, and then merges into Lincoln. A little way down Lincoln, turn left on Merchant, and follow that until you’re approaching the PCH/101. This was the hardest part of the ride for me to follow. I knew that on weekends, the western sidewalk of the bridge was reserved for cyclists, but I had a hell of a time figuring out how to get there. Eventually I worked out you had to take the tunnel under the roadway from Merchant, then bike up on the east side past the gift shop, then follow another tunnelled path under the roadway back to the western side and the bridge’s sidewalk. 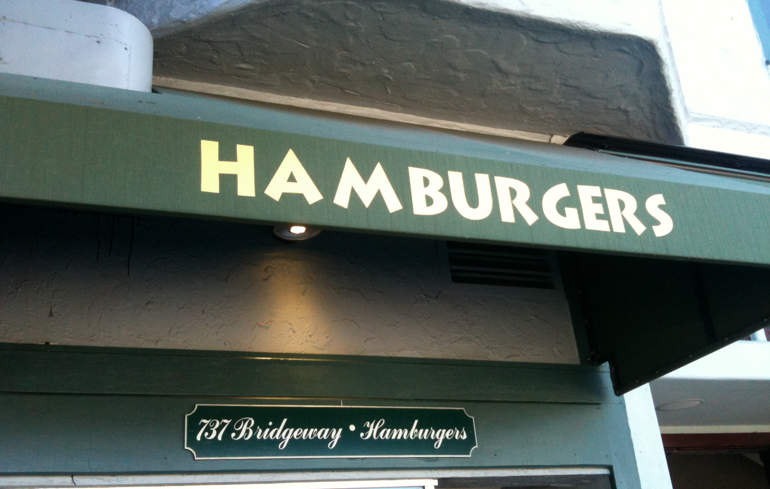 Yelp gave it a thumbs-up, so I ventured in for a cheeseburger and fries. Man, that tasted good! They’re apparently a bit Soup-Nazi in their customer service, but I didn’t see anything other than slight surliness. It was lucky I got there early because they soon had a queue out the door, so I guess I’m not the only one to be hooked by their food. There’s almost no space to eat inside the restaurant, but the park across the road had a gorgeous view over the bay and plenty of benches. Blazing Saddles had suggested taking the ferry back to the city, but after that burger I had a whole new set of calories to burn, so I headed back the way I’d come. It was pretty easy to follow the same route, though I do recommend a detour to the Dolores Park Cafe, which I checked out since its only a block from my new place. Their hot chocolate hit the spot, though you do need to be a fan of canines since its across the street from a great dog park.